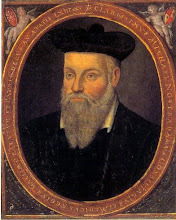 Nostradamus Predictions, New Psychic Future Predictions, Free Complete Prophecies: Nostradamus First Psychic Appearance to Me, John Le Sainte. Nostradamus First Psychic Appearance to Me, John Le Sainte. The Spirit of Nostradamus began his psychic visitations just before Christmas day December 2003. At first I believed these psychic visions of a cloaked man were merely recurring dreams. As each vision began, I , John Le Sainte, would find myself seated at a dark oak table across from a thickly bearded gentleman with a very warm and friendly demeanor. His eyes sparkled with great interest whenever he leaned forward to speak. Upon the table between us would always be a flickering candle and a round silver platter containing an inch or so of water. The first several nights I had some difficulty understanding his words, which sounded to my ears as French, yet we seemed to be communicating none the less. I was asked many questions regarding my understanding of science and nature, political knowledge and religious beliefs. During these early visitations, I did not realize that the visitor to my psychic dreams was Nostradamus. Michel, the French surname equivalent of Michael, was the only name that I knew at first for my mysterious visitor. Michel was very lively and animated, as his hands, arms and entire body were part of his conversation as well. At first, he spoke mostly of medicine, love, nature, mathematics, astrology as well as numerous other subjects. Some of the most interesting conversations involved food and wines. Michel asserted that some foods and drink held great preventitive and healing powers, and some foods poisoned the body and soul. The notes of these psychic conversations now fill volumes of notebooks. Michel claimed to have traveled quite far to fulfill a promise and that he soon needed my help. Please click on these links of other writings within this blog to continue the story. Nostradamus explains that I, John Le Sainte am his sole heir to his psychic gifts of Prophecy.